"Tyrannosaur" redirects here. For the film, see Tyrannosaur (film). Tyrannosauroidea (meaning 'tyrant lizard forms') is a superfamily (or clade) of coelurosaurian theropod dinosaurs that includes the family Tyrannosauridae as well as more basal relatives. Tyrannosauroids lived on the Laurasian supercontinent beginning in the Jurassic Period. By the end of the Cretaceous Period, tyrannosauroids were the dominant large predators in the Northern Hemisphere, culminating in the gigantic Tyrannosaurus. Fossils of tyrannosauroids have been recovered on what are now the continents of North America, Europe, Asia, South America and Australia. Size of some small genera, compared to a human. Tyrannosauroids varied widely in size, although there was a general trend towards increasing size over time. Early tyrannosauroids were small animals. One specimen of Dilong, almost fully grown, measured 1.6 meters (5.3 ft) in length, and a fully-grown Guanlong measured 3 meters (10 ft long). Teeth from lower Lower Cretaceous rocks (140 to 136 million years old) of Hyogo, Japan, appear to have come from an approximately 5 metres (16 ft) long animal, possibly indicating an early size increase in the lineage. An immature Eotyrannus was over 4 meters (13 ft) in length, and a subadult Appalachiosaurus was estimated at more than 6 meters (20 ft) long, indicating that both genera reached larger sizes. The Late Cretaceous tyrannosaurids ranged from the 9 meter (30 ft) Albertosaurus and Gorgosaurus to Tyrannosaurus, which exceeded 12 meters (39 ft) in length and may have weighed more than 6400 kilograms (7 short tons). A 2010 review of the literature concluded that tyrannosaurs were "small- to mid-sized" for their first 80 million years but were "some of the largest terrestrial carnivores to ever live" in their last 20 million years. Skull and neck of Daspletosaurus, from the Field Museum of Natural History in Chicago. Characteristic features of the tyrannosauroid pelvis include a concave notch at the upper front end of the ilium, a sharply defined vertical ridge on the outside surface of the ilium, extending upwards from the acetabulum (hip socket), and a huge "boot" on the end of the pubis, more than half as long as the shaft of the pubis itself. These features are found in all known tyrannosauroids, including basal members Guanlong and Dilong. The pubis is not known in Aviatyrannis or Stokesosaurus but both show typical tyrannosauroid characters in the ilium. The hindlimbs of all tyrannosauroids, like most theropods, had four toes, although the first toe (the hallux) did not contact the ground. Tyrannosauroid hindlimbs are longer relative to body size than almost any other theropods, and show proportions characteristic of fast-running animals, including elongated tibiae and metatarsals. These proportions persist even in the largest adult Tyrannosaurus, despite its probable inability to run. The third metatarsal of tyrannosaurids was pinched at the top between the second and fourth, forming a structure known as the arctometatarsus. The arctometatarsus was also present in Appalachiosaurus but it is unclear whether it was found in Eotyrannus or Dryptosaurus. This structure was shared by derived ornithomimids, troodontids and caenagnathids, but was not present in basal tyrannosauroids like Dilong, indicating convergent evolution. Tyrannosaurus was named by Henry Fairfield Osborn in 1905, along with the family Tyrannosauridae. The name is derived from the Ancient Greek words τυραννος/tyrannos ('tyrant') and σαυρος/sauros ('lizard'). The superfamily name Tyrannosauroidea was first published in a 1964 paper by the British paleontologist Alick Walker. The suffix -oidea, commonly used in the name of animal superfamilies, is derived from the Greek ειδος/eidos ('form'). Skull of Proceratosaurus, a proceratosaurid from the Middle Jurassic of England. Skeleton of Appalachiosaurus, a non-tyrannosaurid tyrannosauroid from the Late Cretaceous of Eastern North America. Some studies have suggested that the clade Megaraptora, usually considered to be allosauroids, are basal tyrannosauroids. However, other authors disputed the placement of megaraptorans within Tyrannosauroidea, and a study of megaraptoran hand anatomy published in 2016 caused even the original scientists suggesting their tyrannosauroid relationships to at least partly reject their prior conclusion. While paleontologists have long recognized the family Tyrannosauridae, its ancestry has been the subject of much debate. For most of the twentieth century, tyrannosaurids were commonly accepted as members of the Carnosauria, which included almost all large theropods. Within this group, the allosaurids were often considered to be ancestral to tyrannosaurids. In the early 1990s, cladistic analyses instead began to place tyrannosaurids into the Coelurosauria, echoing suggestions first published in the 1920s. Tyrannosaurids are now universally considered to be large coelurosaurs. In 1994, Holtz grouped tyrannosauroids with elmisaurids, ornithomimosaurs and troodonts into a coelurosaurian clade called Arctometatarsalia based on a common ankle structure where the second and fourth metatarsals meet near the tarsal bones, covering the third metatarsal when viewed from the front. Basal tyrannosauroids like Dilong, however, were found with non-arctometatarsalian ankles, indicating that this feature evolved convergently. Arctometatarsalia has been dismantled and is no longer used by most paleontologists, with tyrannosauroids usually considered to be basal coelurosaurs outside Maniraptoriformes. One recent analysis found the family Coeluridae, including the Late Jurassic North American genera Coelurus and Tanycolagreus, to be the sister group of Tyrannosauroidea. The most basal tyrannosauroid known from complete skeletal remains is Guanlong, a representative of the family Proceratosauridae. Other early taxa include Stokesosaurus and Aviatyrannis, known from far less complete material. The better-known Dilong is considered slightly more derived than Guanlong and Stokesosaurus. Dryptosaurus, long a difficult genus to classify, has turned up in several recent analyses as a basal tyrannosauroid as well, slightly more distantly related to Tyrannosauridae than Eotyrannus and Appalachiosaurus. Alectrosaurus, a poorly known genus from Mongolia, is definitely a tyrannosauroid but its exact relationships are unclear. Other taxa have been considered possible tyrannosauroids by various authors, including Bagaraatan and Labocania. Siamotyrannus from the Early Cretaceous of Thailand was originally described as an early tyrannosaurid, but is usually considered a carnosaur today. Iliosuchus has a vertical ridge on the ilium reminiscent of tyrannosauroids and may in fact be the earliest known member of the superfamily, but not enough material is known to be sure. Below is a cladogram by Loewen et al. in 2013 that included most tyrannosauroid species known at the time of its publication. Confirmed tyrannosauroid fossils have only been discovered in the northern continents, with possible basal tyrannosauroid fossils reported from Australia. Late Cretaceous tyrannosauroids are known only from North America and Asia. The Middle Cretaceous record of Tyrannosauroidea is rather patchy. Teeth and indeterminate postcrania of this interval are known from the Cenomanian-age Dakota Formation of western North America and Potomac Formation of New Jersey, as well as formations in Kazakhstan and Tajikistan; two genera, Timurlengia and Xiongguanlong, have been found in Asia, while the Brazilian Santanaraptor may belong to this group. An as-yet-undescribed and unnamed tyrannosauroid (informally named "Zunityrannus") has been found in the Moreno Hill Formation of the Zuni Basin of western New Mexico. The first unquestionable remains of tyrannosaurids occur in the Campanian stage of the Late Cretaceous in North America and Asia. Two subfamilies are recognized. The albertosaurines are only known from North America, while the tyrannosaurines are found on both continents. Tyrannosaurid fossils have been found in Alaska, which may have served as a land bridge allowing dispersal between the two continents. Non-tyrannosaurid tyrannosauroids like Alectrosaurus and possibly Bagaraatan were contemporaneous with tyrannosaurids in Asia, while they are absent from western North America. Eastern North America was divided by the Western Interior Seaway in the middle of the Cretaceous and isolated from the western portion of the continent. The absence of tyrannosaurids from the eastern part of the continent suggests that the family evolved after the appearance of the seaway, allowing basal tyrannosauroids like Dryptosaurus and Appalachiosaurus to survive in the east as a relict population until the end of the Cretaceous. Long filamentous structures have been preserved along with skeletal remains of numerous coelurosaurs from the Early Cretaceous Yixian Formation and other nearby geological formations from Liaoning, China. These filaments have usually been interpreted as "protofeathers," homologous with the branched feathers found in birds and some non-avian theropods, although other hypotheses have been proposed. A skeleton of Dilong was described in 2004 that included the first example of feathers in a tyrannosauroid. Similarly to down feathers of modern birds, the feathers found in Dilong were branched but not pennaceous, and may have been used for insulation. Even large tyrannosauroids have been found with evidence of feathers. Yutyrannus huali, also from the Yixian Formation, is known from three specimens, each preserving traces of feathers on various parts of the body. While not all areas of the body preserve impressions across all three specimens, these fossils demonstrate that even in this medium-sized species, most of the body was covered in feathers. The presence of feathers in basal tyrannosauroids is not surprising, since they are now known to be characteristic of coelurosaurs, found in other basal genera like Sinosauropteryx, as well as all more derived groups. Rare fossilized skin impressions of some Late Cretaceous tyrannosaurids lack feathers, however, instead showing skin covered in fine, non-overlapping scales. It is possible that feathers were present on other areas of the body: Preserved skin impressions are very small and come primarily from the legs, pelvic region, and underside of the tail, which either lack feathers or only covered in a light down in some modern larger ground-dwelling birds. Alternatively, secondary loss of feathers in large tyrannosaurids may be analogous with the similar loss of hair in the largest modern mammals like elephants, where a low surface area-to-volume ratio slows down heat transfer, making insulation by a coat of hair unnecessary or even detrimental. A precedent can be seen in other dinosaur groups such as ornithischians, in which filamentous structures were lost and scales reappeared. The elaborate head crest of Guanlong, a basal tyrannosauroid from China. Bony crests are found on the skulls of many theropods, including numerous tyrannosauroids. The most elaborate is found in Guanlong, where the nasal bones support a single, large crest which runs along the midline of the skull from front to back. This crest was penetrated by several large foramina (openings) which reduced its weight. A less prominent crest is found in Dilong, where low, parallel ridges run along each side of the skull, supported by the nasal and lacrimal bones. These ridges curve inwards and meet just behind the nostrils, making the crest Y-shaped. The fused nasals of tyrannosaurids are often very rough-textured. 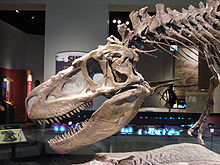 Alioramus, a possible tyrannosaurid from Mongolia, bears a single row of five prominent bony bumps on the nasal bones; a similar row of much lower bumps is present on the skull of Appalachiosaurus, as well as some specimens of Daspletosaurus, Albertosaurus, and Tarbosaurus. In Albertosaurus, Gorgosaurus and Daspletosaurus, there is a prominent horn in front of each eye on the lacrimal bone. The lacrimal horn is absent in Tarbosaurus and Tyrannosaurus, which instead have a crescent-shaped crest behind each eye on the postorbital bone. These head crests may have been used for display, perhaps for species recognition or courtship behavior. An example of the handicap principle may be the case of Guanlong, where the large, delicate crest may have been a hindrance to hunting in what was presumably an active predator. If an individual was healthy and successful at hunting despite the fragile crest, it would indicate the superior quality of the individual over others with smaller crests. Similarly to the unwieldy tail of a male peacock or the outsized antlers of an Irish elk, the crest of Guanlong may have evolved via sexual selection, providing an advantage in courtship that outweighed any decrease in hunting ability. Neonate sized tyrannosaur fossils have been documented in the scientific literature. ^ a b c d e f g h i j k l m n o p q r Holtz, Thomas R. (2004). "Tyrannosauroidea". In Weishampel, David B.; Dodson, Peter; Osmólska, Halszka. The Dinosauria (Second ed.). Berkeley: University of California Press. pp. 111–136. ISBN 978-0-520-24209-8. ^ "Tyrannosaurus ancestor's teeth found in Hyogo". The Japan Times. 2009-06-21. Retrieved 2014-06-28. ^ a b c d e Hutt, Stephen; Naish, Darren (2001). "A preliminary account of a new tyrannosauroid theropod from the Wessex Formation (Early Cretaceous) of southern England". Cretaceous Research. 22 (2): 227–242. doi:10.1006/cres.2001.0252. ^ a b Brusatte, S.L. ; Norell, Mark A.; Carr, Thomas D.; Erickson, Gregory M.; Hutchinson, John R.; Balanoff, Amy M.; Bever, Gabe S.; Choiniere, Jonah N.; Makovicky, Peter J.; Xu, Xing (2010). "Tyrannosaur paleobiology: new research on ancient exemplar organisms" (PDF). Science. 329 (5998): 1481–1485. Bibcode:2010Sci...329.1481B. doi:10.1126/science.1193304. PMID 20847260. ^ Handwerk, B. (16 September 2010). "Tyrannosaurs were human-size for 80 million years". National Geographic News. Retrieved 17 September 2010. ^ a b c Rauhut, Oliver W.M. (2003). "A tyrannosauroid dinosaur from the Upper Jurassic of Portugal". Palaeontology. 46 (5): 903–910. doi:10.1111/1475-4983.00325. ^ Brochu, Christopher R. (2003). "Osteology of Tyrannosaurus rex: insights from a nearly complete skeleton and high-resolution computed tomographic analysis of the skull". Society of Vertebrate Paleontology Memoirs. 7: 1–138. doi:10.2307/3889334. JSTOR 3889334. Archived from the original on 2007-12-12. ^ Hutchinson, John R.; & Garcia, Mariano . (2002). "Tyrannosaurus was not a fast runner". Nature. 415 (6875): 1018–1021. Bibcode:2002Natur.415.1018H. doi:10.1038/4151018a. PMID 11875567. ^ Carpenter, Kenneth; Russell, Dale A. (1997). "Redescription of the holotype of Dryptosaurus aquilunguis (Dinosauria: Theropoda) from the Upper Cretaceous of New Jersey". Journal of Vertebrate Paleontology. 17 (3): 561–573. doi:10.1080/02724634.1997.10011003. Archived from the original on 2010-07-15. ^ a b c Holtz, Thomas R. (1994). "The phylogenetic position of the Tyrannosauridae: implications for theropod systematics". Journal of Paleontology. 68 (5): 1100–1117. doi:10.1017/S0022336000026706. ^ Osborn, Henry F. (1905). "Tyrannosaurus and other Cretaceous carnivorous dinosaurs". Bulletin of the American Museum of Natural History. 21 (3): 259–265. doi:10.1111/j.1468-5965.2007.00735_17.x. hdl:2246/1464. ^ a b Walker, Alick D. (1964). "Triassic reptiles from the Elgin area: Ornithosuchus and the origin of carnosaurs". Philosophical Transactions of the Royal Society of London. Series B, Biological Sciences. 248 (744): 53–134. Bibcode:1964RSPTB.248...53W. doi:10.1098/rstb.1964.0009. ^ a b Bonaparte, José F.; Novas, Fernando E. (1990). "Carnotaurus sastrei Bonaparte, the horned, lightly built carnosaur from the Middle Cretaceous of Patagonia". Contributions in Science (Natural History Museum of Los Angeles County. 416: 1–42. ^ Sereno, Paul C. (2005). "Stem Archosauria — TaxonSearch, Version 1.0". Archived from the original on 2007-12-26. Retrieved 2007-12-10. ^ F. E. Novas; F. L. Agnolín; M. D. Ezcurra; J. I. Canale; J. D. Porfiri (2012). "Megaraptorans as members of an unexpected evolutionary radiation of tyrant-reptiles in Gondwana". Ameghiniana. 49 (Suppl): R33. ^ Yun, C (2015). "Comments on the juvenile Megaraptor specimen and systematic positions of megaraptoran theropods". PeerJ PrePrints. 3: e1051. doi:10.7287/peerj.preprints.851v1. ^ Novas, F.E. ; Rolando, A.M.A. ; Angolan, F.L. (2016). "Phylogenetic relationships of the Cretaceous Gondwanan theropods Megaraptor and Australovenator: the evidence afforded by their manual anatomy" (PDF). Memoirs of Museum Victoria. 74: 49–61. doi:10.24199/j.mmv.2016.74.05. Archived from the original (PDF) on 2016-08-18. ^ Gauthier, Jacques (1986). "Saurischian monophyly and the origin of birds". In Padian, Kevin. The Origin of Birds and the Evolution of Flight. Memoirs of the California Academy of Sciences 8. San Francisco, CA: Published by California Academy of Sciences. pp. 1–55. ISBN 978-0-940228-14-6. ^ Molnar, Ralph E.; Kurzanov, Sergei M. (1990). "Carnosauria". In Weishampel, David B.; Dodson, Peter; Osmólska, Halszka. The Dinosauria (First ed.). Berkeley: University of California Press. pp. 169–209. ISBN 978-0-520-06727-1. ^ Novas, Fernando E. (1992). "The evolution of the carnivorous dinosaurs". In Sanz, José L.; Buscalioni, Angela D. Los Dinosaurios y su Entorno Biotico: Actas del Segundo Curso de Paleontología en Cuenca (in Spanish). Cuenca: Instituto "Juan de Valdez". pp. 125–163. ^ Matthew, William D.; Brown, Barnum (1922). "The family Deinodontidae, with notice of a new genus from the Cretaceous of Alberta". Bulletin of the American Museum of Natural History. 46: 367–385. hdl:2246/1300. ^ von Huene, Friedrich (1923). "Carnivorous Saurischia in Europe since the Triassic". Geological Society of America Bulletin. 34 (3): 449–458. Bibcode:1923GSAB...34..449V. doi:10.1130/GSAB-34-449. ^ a b Senter, Phil (2007). "A new look at the phylogeny of Coelurosauria (Dinosauria, Theropoda)". Journal of Systematic Palaeontology. 5 (4): 429–463. doi:10.1017/S1477201907002143. ^ Sereno, Paul C. (1999). "The evolution of dinosaurs". Science. 284 (5423): 2137–2147. doi:10.1126/science.284.5423.2137. PMID 10381873. ^ a b c Rauhut, Oliver W.M. (2003). The interrelationships and evolution of basal theropod dinosaurs. Special Papers in Palaeontology. 69. pp. 1–213. ISBN 978-0-901702-79-1. ^ a b Norell, Mark A.; Barsbold, Rinchen (2006). "A new dromaeosaurid theropod from Ukhaa Tolgod (Ömnögov, Mongolia)" (PDF). American Museum Novitates. 3545: 1–51. doi:10.1206/0003-0082(2006)3545[1:ANDTFU]2.0.CO;2. hdl:2246/5823. ^ Rauhut, Oliver W. M.; Milner, Angela C.; Moore-Fay, Scott (2010). "Cranial osteology and phylogenetic position of the theropod dinosaur Proceratosaurus bradleyi (Woodward, 1910) from the Middle Jurassic of England". Zoological Journal of the Linnean Society. 158: 155–195. doi:10.1111/j.1096-3642.2009.00591.x. ^ Holtz, Thomas R. (2005-09-20). "RE: Burpee Conference (LONG)". Archives of the Dinosaur Mailing List. Retrieved 2007-06-18. ^ a b Holtz, Thomas R.; Molnar, Ralph E. (2004). "Basal Tetanurae". In Weishampel, David B.; Dodson, Peter; Osmólska, Halszka. The Dinosauria (Second ed.). Berkeley: University of California Press. pp. 71–110. ISBN 978-0-520-24209-8. ^ Loewen, M.A. ; Irmis, R.B. ; Sertich, J.J.W. ; Currie, P. J.; Sampson, S. D. (2013). Evans, David C, ed. "Tyrant Dinosaur Evolution Tracks the Rise and Fall of Late Cretaceous Oceans". PLoS ONE. 8 (11): e79420. Bibcode:2013PLoSO...879420L. doi:10.1371/journal.pone.0079420. PMC 3819173. PMID 24223179. ^ a b Kirkland, James I.; Carpenter, Kenneth (1997). "Lower to Middle Cretaceous Dinosaur faunas of the central Colorado Plateau: a key to understanding 35 million years of tectonics, sedimentology, evolution, and biogeography". Brigham Young University Geology Studies. 42 (II): 69–103. ^ Manabe, Makoto (1999). "The early evolution of the Tyrannosauridae in Asia". Journal of Paleontology. 73 (6): 1176–1178. doi:10.1017/S002233600003105X. ^ Nesov, Lev A. (1995). Dinosaurs of Northern Eurasia: new data about assemblages, ecology and paleobiogeography (in Russian). St. Petersburg: Scientific Research Institute of the Earth's Crust, St. Petersburg State University. p. 156pp. ^ Mcdonald, Wolfe; Kirkland (2010). "A new basal hadrosauroid (Dinosauria: Ornithopoda) from the Turonian of New Mexico". Journal of Vertebrate Paleontology. 30 (3): 799–812. doi:10.1080/02724631003763516. ^ Fiorillo, Anthony R.; & Gangloff, Roland A. (2000). "Theropod teeth from the Prince Creek Formation (Cretaceous) of northern Alaska, with speculations on Arctic dinosaur paleoecology". Journal of Vertebrate Paleontology. 20 (4): 675–682. doi:10.1671/0272-4634(2000)020[0675:TTFTPC]2.0.CO;2. ^ Benson, R. B. J.; Barrett, P. M.; Rich, T. H.; Vickers-Rich, P. (2010). "A southern tyrant reptile" (PDF). Science. 327 (5973): 1613. Bibcode:2010Sci...327.1613B. doi:10.1126/science.1187456. PMID 20339066. ^ a b Chen Peiji, Pei-ji; Dong Zhiming; Zhen, Shuo-Nan (1998). "An exceptionally well-preserved theropod dinosaur from the Yixian Formation of China". Nature. 391 (6663): 147–152. Bibcode:1998Natur.391..147C. doi:10.1038/34356. ^ Xu Xing, X; Zhou Zhonghe & Prum, Richard A. (2003). "Branched integumental structures in Sinornithosaurus and the origin of feathers". Nature. 410 (6825): 200–204. doi:10.1038/35065589. PMID 11242078. ^ Lingham-Soliar, Theagarten; Feduccia, Alan (2007). "A new Chinese specimen indicates that 'protofeathers' in the Early Cretaceous theropod dinosaur Sinosauropteryx are degraded collagen fibres". Proceedings of the Royal Society of London. Series B, Biological Sciences. 274 (1620): 1823–1829. doi:10.1098/rspb.2007.0352. PMC 2270928. PMID 17521978. ^ Xu, X.; Wang, K.; Zhang, K.; Ma, Q.; Xing, L.; Sullivan, C.; Hu, D.; Cheng, S.; Wang, S.; et al. (2012). "A gigantic feathered dinosaur from the Lower Cretaceous of China" (PDF). Nature. 484 (7392): 92–95. Bibcode:2012Natur.484...92X. doi:10.1038/nature10906. PMID 22481363. Archived from the original (PDF) on 17 April 2012. ^ Martin, Larry D.; & Czerkas, Stephan A. (2000). "The fossil record of feather evolution in the Mesozoic". American Zoologist. 40 (4): 687–694. doi:10.1668/0003-1569(2000)040[0687:TFROFE]2.0.CO;2. ^ Carr, Thomas (Sep 2014). "Ten things we don't know about Tyrannosaurs". Things We Don't Know Blog. List of tyrannosauroid specimens and species at The Theropod Database.